Now this bread right here, the one pictured right above this line, this is why I’m doing all these variations. Yesterday, I experimented with fermenting (aka: the first rise) the dough overnight in the refrigerator. Today, I tried proofing the dough overnight in the refrigerator. What’s the difference, you ask? Well, the same chemical processes are taking place in both fermentation and proofing: yeast multiplies, converting carbohydrates into alcohol, carbon dioxide, and acids. The network of gluten holds in gases, and the bread becomes leavened, or risen, in both stages. 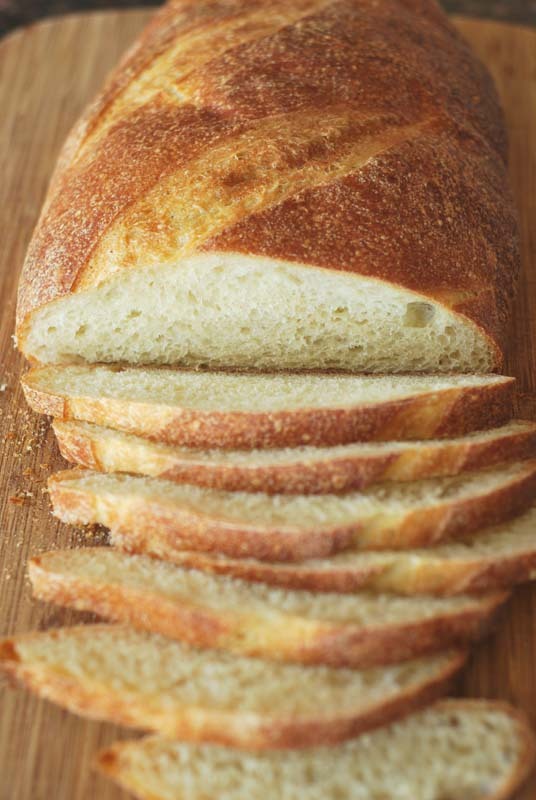 But fermentation takes place before the bread is shaped, and proofing takes place afterwards. Yes, that’s the only difference. So what’s the point of this experiment? How much difference could there possibly be? Plenty! Yesterday’s bread, with an autolyse and a refrigerated overnight ferment, came out pretty much exactly like the bread from the day before, the one with an autolyse and a 1 hour room-temperature ferment. Today’s bread, however, which used an autolyse and a refrigerated overnight proof, waaaaaas rubbish! Okay, maybe “rubbish” is a bit harsh. But this bread was definitely sub-par! Perhaps the gluten became overdeveloped by sitting so long, because the oven-spring (how much the loaf rises in the oven) was minimal, as you can tell from the above picture. The slashes are flat and even with the rest of the crust, see? Now look at the picture of the bread from yesterday. That’s a big difference! And can you tell how squat and flat this bread is? As you might have guessed from the lack of oven-spring, the crumb was a bit dense. There were a few big air pockets, but overall, it was much less airy than the previous three variations. The flavor was basically good, if a little sour (as all long-rising breads tend to be; it’s not necessarily a bad thing); but the texture was overly chewy, and the crust was somehow crisp and tough. Not to mention that while the bread sat at room temperature after its chilly proof, just before baking, it developed a monster air bubble on one side, like a giant tumor. It deflated like a flat tire when I slashed the bread, making the loaf lopsided, and looking a bit sad. This particular part of the crust also bears the distinct and dubious honor of marking the first time I’ve ever cut myself on bread crust. This was not a little puncture (which I’ve done before, tearing apart a slightly stale and particularly crusty bread), but a legitimate cut. What the heck, bread? What’d I ever do to you? Oh, right – I let you proof in the fridge overnight. I’m sorry, bread. I promise never to do it again. Unless, that is, explicitly instructed to by Nancy Silverton, or those of her ilk. Otherwise, I pledge to autolyse as often as possible, ferment in the fridge if necessary, but never proof in the fridge! Friends? Okay! 1. In the bowl of a stand mixer, whisk together all but a handful of the flour and all the yeast. Add the water and mix with the dough hook at low speed until a rough dough forms, about 1 minute. Turn the mixer off, and without removing the bowl or the hook, cover the bowl loosely with plastic wrap. Let stand for at least 15 to 20 minutes, or up to 45 minutes. 3. Turn the dough out onto a lightly floured surface, and knead a few times, forming the dough into a round ball with a skin stretching over the outside. Transfer to a lightly oiled bowl, smooth side up. Cover and let rise in a warm place until doubled in size, about 1 hour. 4. Let the dough stand at room temperature for 45 minutes to 1 hour before proceeding. Line a large baking sheet with parchment paper. Gently deflate the dough, and turn out onto a lightly floured surface. Flatten the dough into a slight rectangle or oval shape. Fold the two corners furthest away from you into the center of the dough, as though you were beginning to fold a paper airplane. Starting with that point, roll the dough up into a cylinder, pressing gently to seal as you roll. Press the final seam to seal. Transfer the dough to the prepared baking sheet, seam-side down. Tuck the ends under if desired, to make a more attractive loaf. Cover loosely but thoroughly with lightly-oiled plastic wrap, and refrigerate overnight, or for 8 hours. 5. Remove dough from refrigerator, loosen plastic wrap if needed, and let stand at room temperature for 30 to 45 minutes. Preheat the oven to 425º F, and place another baking sheet or oven-safe pan in the bottom of the oven. If you have a baking stone, heat it with the oven. If not, your baking sheet is fine. 6. Using a sharp serrated knife or clean razor blade, make three decisive slashes in the top of the loaf at a 45º angle, evenly spaced. Transfer the bread to the oven (or baking stone, if using). Immediately throw 4 or 5 ice cubes into the hot pan on the oven floor. Bake for 10 minutes, adding additional ice cubes as they melt. 7. After 10 minutes, remove the ice-cube-pan from the oven, and bake the loaf for an additional 15 to 25 minutes, or until deeply golden brown. Remove the bread to a wire rack to cool before slicing. 2. In case it wasn’t made clear, I do not reccommend this method; unless you have a very good reason for doing so. Wow, I’m so excited to have found your site! I’ve had an unreasonable fear of working with yeast, but I’m dying to try my hand at breadmaking, this will be so helpful! Thanks! Love your blog, too! Let me know if you have any breadly questions; I’m always happy to help! I’m more of a cake baker and only recently have gotten into bread. Since the batches I made were usually too big for me to finish eating before going stale, I used to proof half the batch in the fridge for a day or two before baking. I ran into the same problem of deflating when slashed and tumor like air bubble. One day when the loaf accidentally stuck to the cutting board, I was forced to deflate and reshape the dough. I covered with a damp towel and let rise in the oven for about an hour after turning it on for a few seconds (because it was 55 F in my kitchen and way too cold for a rise). After slashing and baking the loaf, I found that it sprung much better than loaves I didn’t bother reshaping after an overnight proof. I still prefer autolyse and preferments, but this loaf wasn’t too bad. Liz: Sounds like an interesting method; I’ll have to give it a shot!